Around noon today, employees of Steel City Media — which includes City Paper, BOB-FM and Q92 — were not eating lunch. Rather, they were watching Harlem Globetrotter's Joyce "Sweet J" Ekworomadu dribble and spin the iconic red-white-and-blue Globetrotters basketball in the air, through her legs and around her back. Who wouldn't want this on their lunch break? Ekworomadu is a 5'10" Texas State University grad who's played professionally worldwide and has been on Nigeria's national team since 2007 — both of the Dallas native's parents are from Nigeria. She stopped by the SCM offices to promote the current Globetrotters tour — which comes to Pittsburgh on Dec. 26 — and to answer some questions about her experience. Tell us what it's like for you to be a Harlem Globetrotter. 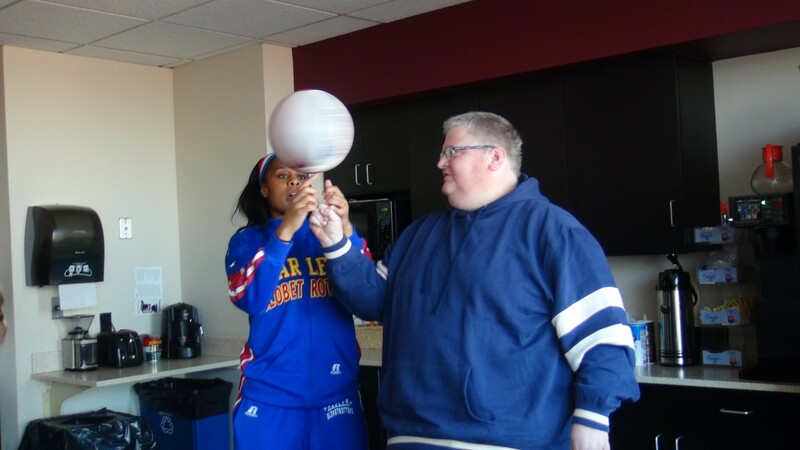 Harlem Globetrotter Sweet J teaches City Paper editor Charlie Deitch how to spin the basketball on his finger. Is there a trick that you hate doing? Actually I’m obsessed with doing tricks now, All through my life I was playing straight-up competitive basketball, working on fundamental skills trying to get to the WNBA and going to college, which I did do, finished [college] in 2008, went to the WNBA in 2008 with San Antonio. So, I never thought to spin the ball on my finger or like spin it on my head or anything. Now I’m like, “Hey everyone!” [as she spins the ball across her shoulders.] Now, I’m totally addicted. That one behind the back, I just learned how to do that. It took a lot of practice, so I guess that’s my favorite now. I don’t have it 100 percent, I’m like 97 percent there. Until I get that down, that’s going to be my favorite. When’s the last time you lost to those suckers you play? The Washington Generals! We lost to them in 1971. I wasn’t even born! Actually you know the whole thing with the Golden State Warriors and their whole streak, well, the Globetrotters actually had to tweet out that they’re only a couple thousand games behind us! Who’s your favorite pro hoops player? Well, I actually grew up watching Allen Iverson. Sort of like Steph Curry, they’re not your freak-of-nature athlete. Not too big, not too muscular. But, he [Iverson] was outstanding when he was in the NBA because he was undersized and still getting in the paint against 7-footers and scoring. What’s your record for spinning the ball on your finger? For me, I could probably go about 12-13 seconds, but I have teammates who can go like 16 seconds. We have a guy named Slick who can spin two balls at the same time, do tricks with two balls at the same time. I’ve got a teammate who just broke the world record for spinning it on his nose, which is amazing. These are veteran guys who are about 10-14 years in. 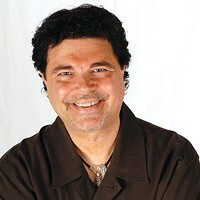 I come in, I’m going into my third season, and I’m kind of impatient, and I’m like, "I need to get that right now!” But they say, "Look, it took us some time to get that too." Are you planning to learn to spin it on your nose? No, I like my nose. I don’t want to shed skin trying to spin it on my nose. I’ll just stick to spinning it on my finger.